To keep the cold out during climbing sessions, this women's zipped hoodie in SMART BLEND COTTON spreads toasty warmth in an original technical package. Giving extra thermal boost and breathability, t he COTTON is enriched by polyester fibers for superior in-action comfort: the COTTON keeps its natural supple softness without getting sweat-soaked during exertion - or getting heavier either. The modern wide rear elastic panel at the hem ensures a snug fit against the back, to keep drafts away from the sensitive area. 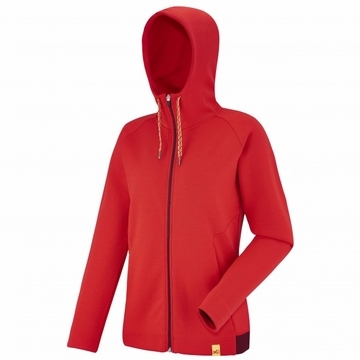 Functional and feminine, the LD NOSY HARA SWEAT HOODIE has two handwarmer pockets and a protective high collar to block out wind at the foot of climbing routes.